Our guest bathroom needed help the day we moved into our home. But, as things go, it got ignored. There were so many more important things to do in the home, and the bathroom wasn't actually in truly awful condition. I know the picture above looks horrible, but one we got the estate sale leftovers cleaned up, the only real problem was the floor. Eventually,tThis little bathroom will be gutted and we'll start over from scratch. So, we didn't want to spend a ton of money to in getting it usable. But seriously - let's get this thing functional! So, last week, we gave this little bathroom a little refresh and turned it into a space we'd be proud to invite our house guests into. Check it out! This bathroom wasn't bad before. In fact it was really quite decent. But once the rest of the home was redone, the styles didn't coordinate. And just wait until you see how incredible the new boho chic bathroom is! Click through to find out, and to get some tips on how to achieve a contemporary version of the bohemian trend. This bathroom looked like so many other builder-grade bathrooms - basic tile, a cheap vanity and zero personality. But once Megan Pflug got her hands on it, the new space suddenly took on a whole new stylish vibe. And get this - there were no major renovations involved! Click through to check out the trendy result. This bathroom was like many many others out there - filled with builder-grade materials from decades past. But its owners saw past the drab brown hues and transformed it into a fresh new space with a bold color scheme. Click through to see what it looks like now. This bathroom was nothing special before. It lacked color, and needed some serious personality to give it a unique feel. Just wait until you see what the owners did to it! Talk about a complete 180. Click through to check out the finished product. This master bath was nothing special. It had a very average look to it, with lots of medium toned colors and no real wow-factor. But not anymore! Click through to check out this bathroom now that the owners have added picture frame moulding, gold accents, a fantastic new wall color and lots of other little details. 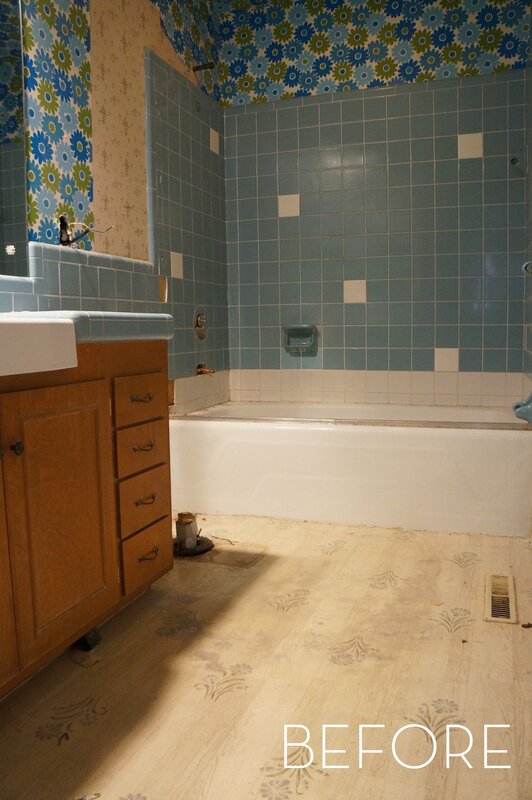 This small (and very average) bathroom certainly isn't the worst 'before' that has ever been shared here on Curbly. But the reason I think makeover is so interesting is because of just how average it was intially - not entirely awful, but also no where near great. Right? Maybe it reminds you of your current bathroom in one or another? And if that's the case, you're definitely going to want to click through to see the 'after'. This is the sort of makeover where the transformation is so drastic that the space is barely recognizable after. The original home was drab, sparse and very blah. But not anymore. Continue reading to check out the incredibly chic, stylish home after the makeover. This all white bathroom was lacking in the personality and style department before, but is now a beautiful, relaxing space that might just inspire your next bathroom renovation. Want to see how it turned out? 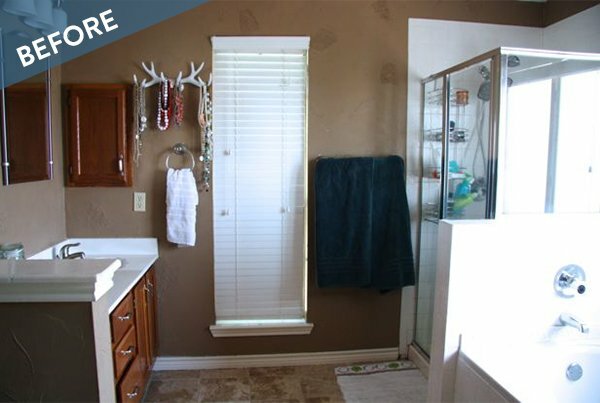 This bathroom was in desperate need of some character... and boy, did it ever get it! Click through to find out how a bold black and white pattern and dramatic cabinets gave this space a drastic new look. Who doesn't enjoy a good before and after? This bathroom is no exception. It started out as a space that was lackluster and plain. And now? It couldn't look more different - not to mention how much BIGGER the space feels! It gives off a very serene and spa-like vibe.